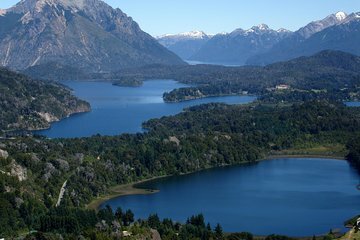 Haga un crucero por el lago Nahuel Huapi, y luego emprenda una caminata por la naturaleza tanto en el Parque Nacional Los Arrayanes como en la Isla Victoria durante este viaje de un día desde Bariloche. Tome un paseo en catamarán a la pintoresca península de Quetrihué para pasear por el último bosque de arrayán y el bosque de coníferas de la isla Victoria. El transporte desde los hoteles locales de Bariloche está incluido en este itinerario de 8 horas. Transporte de ida y vuelta desde tu hotel de Bariloche incluido. Reúnete con tu guía en la recogida en el hotel en Bariloche, luego transfiere a un catamarán en Puerto Pañuelo, cerca del lujoso hotel Llao-Llao. Navegue por el lago Nahuel Huapi en el Parque Nacional Nahuel Huapi durante una hora mientras admira los hermosos paisajes. Disfrute del almuerzo disponible para comprar a bordo o siéntase libre de traer el suyo. Deténgase en la isla Victoria, la más grande de las islas del lago Nahuel Huapi, y desembarque en Puerto Anchorena. Sigue a tu guía en un tranquilo paseo por el bosque de coníferas y aprende sobre árboles como abedules, abetos, sequioas y aromas. Visite durante los meses de verano para incluir un chapuzón en el lago cerca de la playa Toro o un paseo en el telesilla hasta el Cerro Bella Vista (colina Bella Vista). Continúe su paseo en catamarán por el hermoso lago alpino, luego desembarque en la península de Quetrihué para explorar el Parque Nacional Los Arrayanes. Aprende sobre los árboles de arrayán, que solo crecen hacia la madurez en este estrecho istmo de tierra cerca de Villa Angostura. Pasee por el camino para admirar los árboles centenarios con corteza de color canela. Vea una pequeña y singular cabaña en medio del bosque, así como algunos pudú, una especie de ciervo en miniatura. Después de un día lleno de aventuras en el lago y en los bosques, regrese a Bariloche para dejar en su hotel. This is an amazing tour if you get the right language guide. The boat ride in the lake is spectacular, the walk through the Arrayan Forest is beautiful. Was a lovely day with plenty of free time to wander around on your own. To startling, the Company emailed via Viator to say they wouldn't pick us up from the hotel. Then they said they d picks up near the hotel, then they picked us up across the road from the hotel. Nowhere on the Viator trip description did it say we would have to pay additional charges, nor did it say that the English speaking guide would only occasionally speak, english. The trip itself was ok, a well run marketing tool with some lovely scenery. It was a great trip, although -- the tour was all in spanish-- and my husband did not get background history of the tour as it was not translated in English- I had to provide the translation. Beautiful scenery! Our guide Sabestin didn't translate and only explained everything in Spanish; there is no chairlift (been out of commission since 2005; false advertising as the trip was not a "Small-group tour limited to 10 people ensures a personalized experience"! It was more like a sausage factory experience!! The tour we got is nothing like discribed,we bought a tour for at most a group of 10 people with an english guid we got picked up from the hotel transfered to the port got on a bout with 150 tourists all the tour was in spanish .we asked for an explanetion from the tou guide on the bout and showd our tour discription, she knew nothing about, all she said is that she is not from the tour agency which is responsible for us.the tour agency which was supposed to take care of us had no representatives on bord the bout.it is very upseting to buy a tour and get only the transportation but no tour guide especialy becouse we are leaving on the 27 december. In the tour description on your website, the tour was described as a maximum of 10 people, in a catamaran with an English speaking guide. These we the reasons that I booked the tour. The tour was actually on a huge boat with about 80 other people on it. The guide did not speak English at all. Every instruction and examination was only in Spanish. I was extremely disappointed and felt the tour description on the Viator website did not accurately describe this tour. I felt very mislead by the description on the website and did not get what I paid for.